The Formidable WordPress PayPal plugin adds online PayPal forms to your site. Collect instant payments from your customers after form submission, even if they don’t have a PayPal account. The "Submit" button on your Formidable Forms sends the customer and their purchase details to a PayPal payment page. Once there, they make the choice to use a PayPal account or a credit card. Set up one-time or recurring subscription payments in no time. Add conditional logic to PayPal forms when used alongside the Pro version of Formidable. Only send customers to PayPal when they make the selections you decide. When collecting payments, do you want to allow customers to choose whether to pay by check or pay immediately with PayPal? No problem. 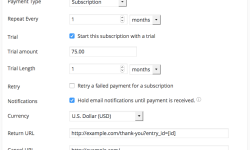 Not only can your WordPress forms collect a one time payment, but they can also create a subscription for PayPal recurring payments. This allows you to charge monthly to keep a listing published, automatically pay for music lessons, or other ongoing services you provide. Start with a trial amount if you prefer. This can be used for either a smaller or larger upfront payment before the recurring payments begin. Why should I collect payments online? When you collect payments online, your options open wide. Save time by eliminating the need to record manual payments. Let our PayPal forms plugin do it for you. Do you collect and publish information from your customers on your website? Maybe you collect classified ads or host a job board? 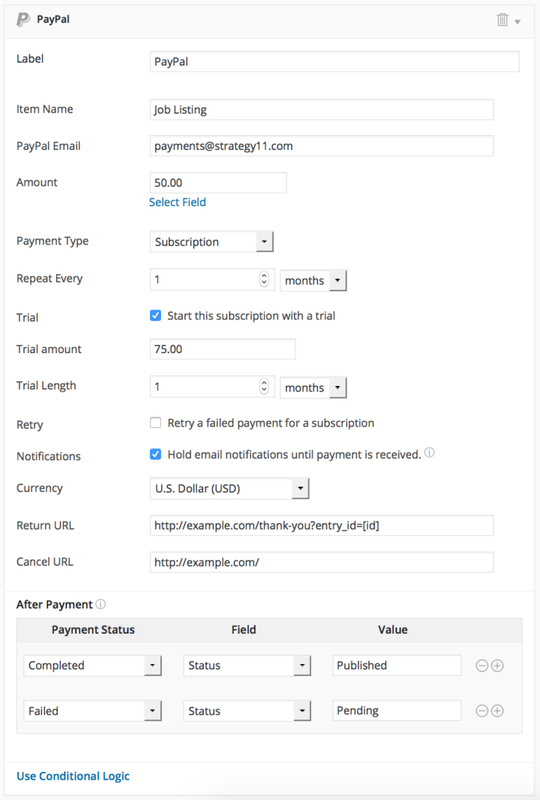 Require a payment before publishing any user-submitted content on your site. Our PayPal forms plugin automatically makes changes to the form submission when a payment is successful or when a recurring payment fails. That way, you don't have to manually publish and remove anything. It's all automated and seamless. The WordPress PayPal plugin for Formidable Forms is user-friendly and easy to implement. See the setup instructions to create PayPal forms. Get started with Formidable Forms today!